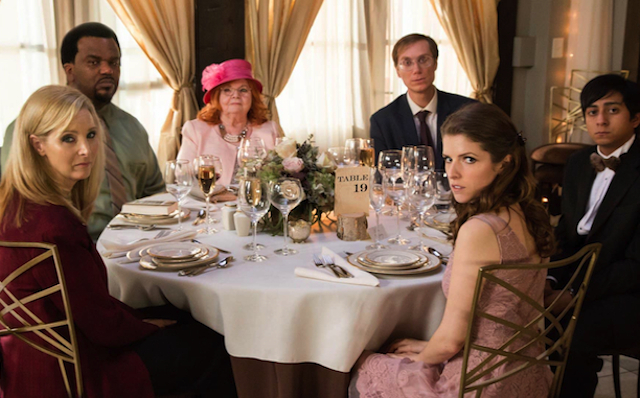 “Table 19” centers on a wedding reception in Michigan. Some of the guests at this reception are seated at that number 19 table, which is next to the bathroom, as far away from the wedding party as you possibly can get, and are the ones with only the most distant of connections to the bride and groom. As the movie itself puts it, this is the table for the people who should have known enough to have replied “no” to the invitation. There’s the childhood nanny of the bride (June Squibb), a distant cousin (Stephen Merchant) –recently released from prison for crimes unknown – a bickering couple who owns a diner (Craig Robinson and Lisa Kudrow), and the son of a recently deceased family friend (Tony Revoli). They’re joined by the former maid of honor (Anna Kendrick) who was deposed from her spot when the best man and brother of the bride (Wyatt Russell) broke up with her. Each of these characters come complete with their own sets of quirks.